Therefore, humble yourselves under the mighty hand of God, so that at the right time he may lift you up. Throw all your anxieties upon him, because he cares about you. So be humble under God’s powerful hand. Then he will lift you up when the right time comes. Give all your worries to him, because he cares for you. Be humbled by God’s power so that when the right time comes he will honor you. Turn all your anxiety over to God because he cares for you. 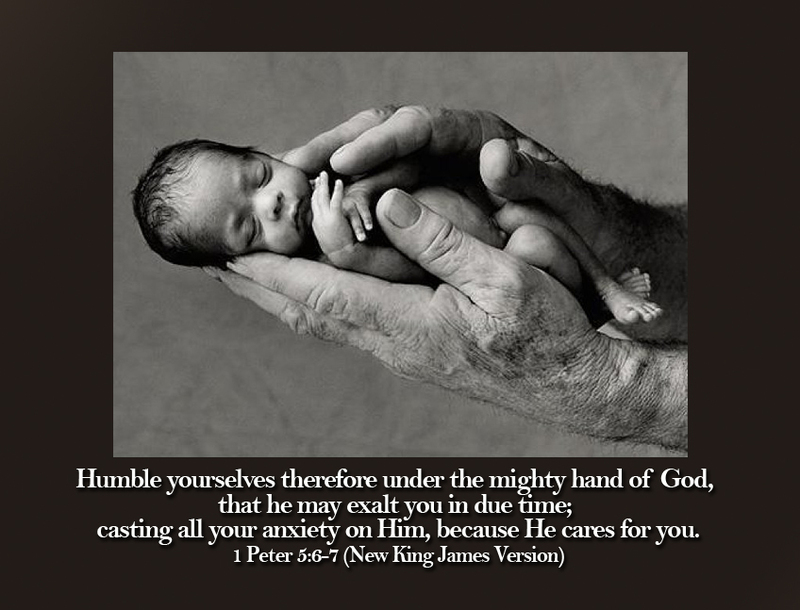 Humble yourselves, therefore, under the mighty hand of God, so that He may exalt you at the proper time,casting all your care on Him, because He cares about you. So be content with who you are, and don't put on airs. God's strong hand is on you; he'll promote you at the right time. Live carefree before God; he is most careful with you. 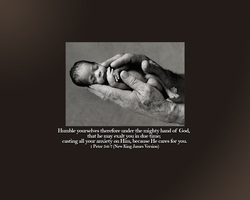 Be humble under God's powerful hand so he will lift you up when the right time comes.7 Give all your worries to him, because he cares about you. So don't be proud. Put yourselves under God's mighty hand. Then he will honor you at the right time. Turn all your worries over to him. He cares about you. So put away all pride from yourselves. You are standing under the powerful hand of God. At the right time He will lift you up. Give all your worries to Him because He cares for you.